I picked this Kindle book at random some time ago, probably because it was reduced in price – I can’t remember. Until I looked it up on the Internet later, I had no idea it had been made into a film, or that there was a sequel. While I was reading it, the story actually felt quite complete. When I started reading it on the plane, quite a long way into our eleven hour flight, it engaged me right away. Here was this young American woman, living in New York, with a Mother and a jolly great-aunt. Said young girl had a Jane Austen obsession, more particularly a Mr Darcy fixation, which was getting in the way whenever she met a potential boyfriend. In her will, Great Aunt Carolyn left her a trip to a Jane Austen holiday in Kent, as a sort of rehab, to allow mc (whose name was also ‘Jane’) to get over Mr Darcy and on with her life in twenty-first century New York. This novel was unashamedly genre fiction, but very well-written genre fiction. The author got into all her characters very effectively, showing attitudes and emotions very effectively through their actions, how they looked, how they moved, or even shifted their position – in the same way as Christopher Isherwood did, actually. For the largest part, she concentrated on the small party of characters in the ‘Jane Austen house’, all of whom were distinct, plausible and well-drawn. On the other hand, Shannon did ‘tell’ quite a bit, about Jane’s interest in basketball, for instance, which turned up quite suddenly half way through the story. Even more annoying were her frequent changes in points of view – within chapters and even within scenes. Also, although most of the action was supposed to take place in Kent, nothing in the descriptive passages made me feel I was in England, that Shannon had visited Kent at the time she wrote this, or had even researched it. Would I recommend this book? Well, yes, I enjoyed it. It was a light enjoyable read, but nothing more than that. Meanwhile here are one photo of Saigon… Beg it’s pardon. Ho Chu Minh City. I’m told by the locals that you should always write Ho Chu Minh City but it’s funny that when they themselves say it out loud, it always comes out as ‘Saigon’. 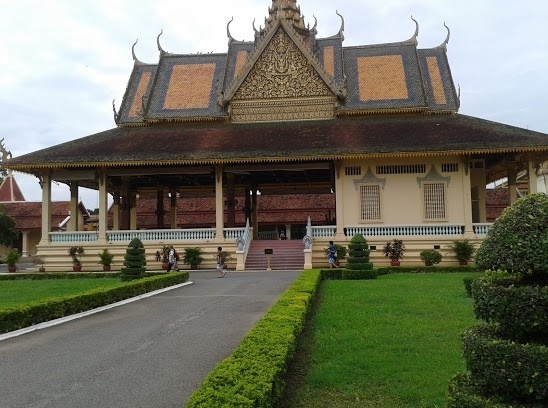 And a couple of the Royal Palace in Phnom Penh, Cambodia. 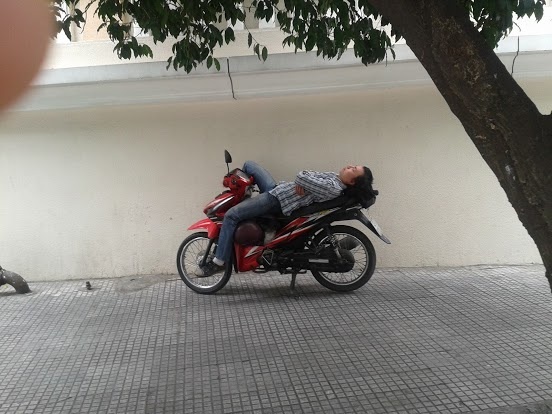 Man asleep on motorbike in Saigon. One of the buildings at the Royal Palace. 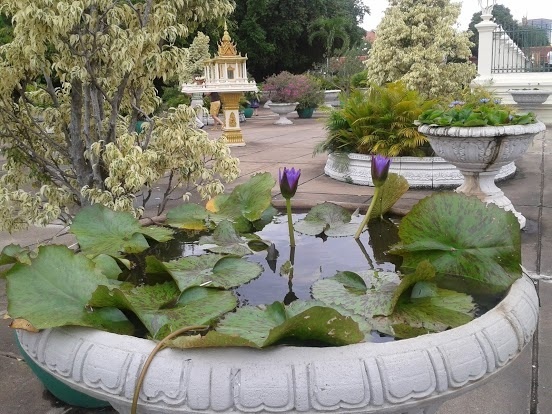 This entry was posted in Hale, Shannon and tagged Austenland, Cambodia, Phnom penh, saigon, Shannon Hale, vietnam on 02/08/2013 by Rosemary Reader and Writer.